The joy of intellectual immersion... again! 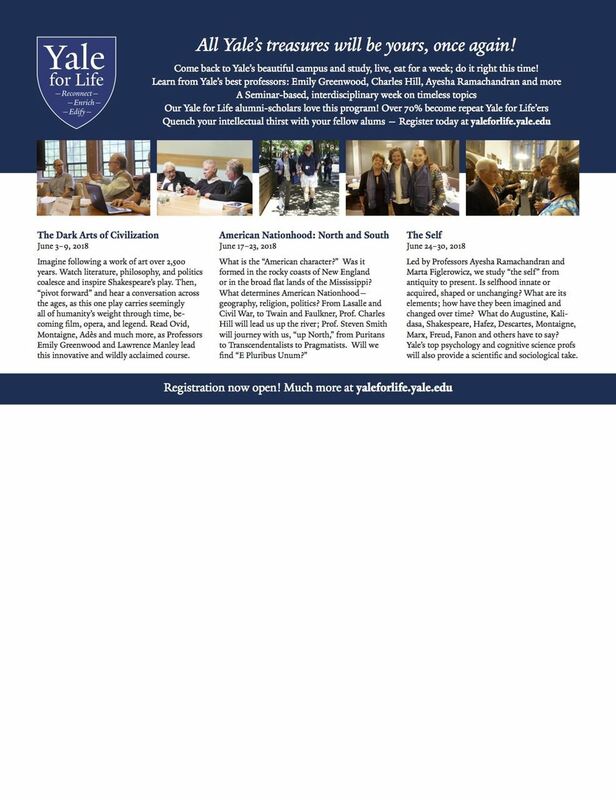 Yale for Life brings alumni and/or their spouses and partners back to Yale in June for a week or more of intensive study and immersion in the life of Yale. It provides a level of engagement with the University that most of us have not had since our time there as students, and provides, as one student from an earlier program said, "the greatest intellectual experience of my life." We live on campus - this year, in the new colleges! - with full swipe-card access to everything; we eat in the colleges (breakfast and lunch; dinner is at fine restaurants around New Haven). We attend seminar classes - not lectures - for 5 hours per day or more, on a timeless, interdisciplinary subject, with the very best of Yale's faculty. The classes are limited to 21 students, so the week produces a bond among the students - and the faculty - that has proven enduring. Since the program's founding in 2011 - by then-Dean Mary Miller and Linda Lorimer - over 60% of Yale for Life students have come back to take another course. 100% of participants - including faculty - have joined a private online discussion group that, every day, sees contributions and conversations that echo the themes that we explored so intensely in New Haven. This year, we are offering three courses: "American Nationhood: North and South," “The Dark Arts of Civilization,” and “Histories of The Self.” “American Nationhood” has long been sold out with a lengthy wait list. “Dark Arts” filled within days of registration's opening, but we have had a rash of health-related cancellations there, so we now have 4 openings. Meanwhile, “The Self” also has a few openings; it is a very different sort of course, which I believe may appeal to groups of alumni that may not be as aware of our program - somewhat younger, for example. We very much wish to fill these openings, but more than that, the program is so special that we need to make our alumni aware of it, so that those who hear of it and are intrigued will not miss the opportunity to take it. In Yale for Life we utilize both "lead" and "guest" faculty. The Lead faculty teach every day; they eat with us at dinner and frequently lunch; they attend "special events" (more on that in a minute) with us. It is no exaggeration to say that the lead faculty form a relationship with the alumni that is closer than any faculty friendship you may have made while at Yale; after all, we are now nearly or actually their peers. In the Dark Arts course this year, we have the amazing professors Emily Greenwood and Larry Manley at the helm. Emily, in particular, is a “big get” for our program; she is such an outstanding teacher that she was selected to give the keynote address to the incoming freshmen, a honor that usually falls to the best teacher at Yale. Guest faculty in this course is an all-star team of a range of disciplines; from Drama to Opera to Film and beyond. In the Self course, superstar profs Ayesha Ramachandran and Marta Figlerowicz are the leads, and there is a dizzying array of guests including Dean of the Faculty Tamar Gendler. (Check out the website, yaleforlife.org/faculty, for more info on this!) Of course, we have always attracted the top faculty, from Akhil Amar to Charles Hill, Beverly Gage, John Gaddis, Jane Levin, and even former Secretary of State Henry Kissinger came - twice - to teach a seminar. We hold special events during the course as another way of fulfilling the promise of our motto: "All Yale's treasures will be yours, once again." This year our courses will take us from the Art Gallery to film showings, to the Peabody Museum, the Yale Cabaret, the Beinecke, the Law School Rare Book Room, and many more. We will have Yale Drama students performing scenes from The Tempest for us, directed by the head of the Yale School of Drama. It is a feast. The readings are done ahead of time, and the reading list itself is one of the great attractions of the course. Through scholarly reading of the type none of us do in our "regular" lives, we will deepen, revise, and discover an understanding of a great topic, essentially “getting smarter,” not just gaining more knowledge. All the books and articles are provided as part of the course fee. The fee for the course is $4,900, including housing, tuition, all meals/food/drink, books, and so on. The dates are June 3-9 (Dark Arts), and June 24-30 (The Self). Because there is substantial reading to be done, and because the time spent in anticipation and preparation is a big part of the fun and appeal, we have what might seem like an early deadline of April 15. This should allow anyone to prepare adequately. Our website contains a wealth of information about the program, including testimonials. I encourage you to explore it. This is not just observing or remembering Yale - this is being part of Yale, in New Haven, on the campus, in a real and serious academic environment and pursuit. However - no tests, no grades, no pressure; only savoring and inhaling the joy of intellectual immersion with a group of similarly engaged and extremely interesting people.